During the Japanese occupation of Korea, Yeong-ae (Kim Sae-ron (김새론), the arrogant daughter of a rich man in the village, studies hard to learn the language of the hostile force and be accepted within the ranks. Poverty-stricken Jong-boon (Kim Hyang-ki (김향기), meanwhile, must contend herself with menial chores until the possibility of marrying out of hardship arises. Yet when the Japanese forces come looking for girls to be ‘comfort women’ – or rather, sexual slaves – financial status does not enter consideration and both youngsters are abducted into a life of horrific servitude. In the present day Jong-boon (Kim Yeong-ok (김영옥), now an elderly woman, lives alone in a dilapidated part of town. Noticing that her teenage neighbour Eun-soo (Cho Soo-hyang (조수향) is in trouble, she takes it alone herself to help the girl and in doing so is forced to confront the traumatic experiences of her past. Snowy Road originally aired as a two-part television drama, yet for the purpose of a cinematic release the episodes have been edited together to create a powerful testament to the horrific abuses Korean women suffered during the Japanese occupation. 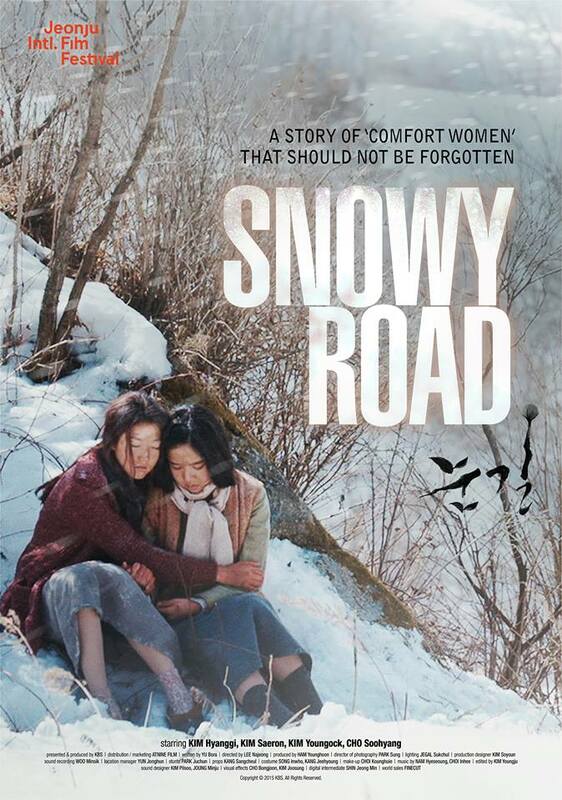 Despite a large number of films and documentaries exploring the subject matter over the years, upon receiving its world premiere at Jeonju Film Festival 2015, Snowy Road left audiences sobbing at the depiction of two of Korea’s youngest and most celebrated actresses reenacting the torture so many women suffered at the hands of the Japanese Imperial Army. While the film does not always escape the production shortcomings and melodramatic trappings of K-drama, Snowy Road is a particularly emotional piece that strongly resonates. Director Lee Na-jeong and writer Yoo Bo-ra have crafted an impressive tribute to women’s suffering in both the past and present through the non-linear story, cutting between the two periods to reinforce how women’s rights have changed and how far they have yet to go. For scenes in the past, director Lee conveys the atrocities committed to Korean women through the abduction, imprisonment and abuses Yeong-ae and Jong-boon endure at the hands of the Japanese. Yet in the present a rather different set of injustices are dealt with, as elderly Jong-boon is routinely treated with disrespect while her young charge Eun-soo, alone and in need of money, becomes easy prey for wealthy middle-aged men. It is difficult to state how brave director Lee and writer Yoo are for examining the abuses of the past (Japanese men) and present (Korean men) and depicting them parallel to each other through the narrative, especially given the current highly conservative and patriarchal political climate, as well as with anti-Japanese sentiment so high following Prime Minister Abe’s denial that the incidents ever occurred. That is not to say that the crimes are in any way equal – rather, that Lee and Yoo’s bravery comes from not over-simplifying the debates put forth as purely the result of an external ‘other’, but also critically looking within contemporary Korean culture to explore the plights that effect modern Korean women. Snowy Road presents the issues well, impressively articulating that women need to stand united against injustices past and present to draw attention to their plight, rather than internalise guilt and shame. While Snowy Road ambitiously tackles such sensitive issues competently, the film consistently struggles to escape its origins, existing somewhere between a TV drama and film but not quite fitting into either category. Cinematography of landscapes are generally composed with skill and appear cinematic, yet when faced with more intimate moments or generating tension the budget limitations become increasingly clear. As such crucial scenes, most explicitly apparent at the internment camp where Yeong-ae and Jong-boon are abused, lack the potency and sense of urgency that a film of this nature should contain. The film also falls into cliche TV drama territory as the narrative attempts to come to a close. Melodrama has long been a feature of Korean TV and film output so it comes as little surprise that such generic devices arise in Snowy Road, however a film dealing with the subject matter of comfort women hardly requires such heavy-handed efforts to evoke tears from the audience. The story is tragic enough without additional manipulative melodramatic tropes, and their inclusion does a disservice to those who experienced such horrific trauma. However that said, director Lee has chosen a particularly solid cast to express the issues being put forth. Kim Sae-ron is really developing into a wonderfully talented actress, and following her stellar performance in A Girl at My Door she exudes the icy arrogance of her character in Snowy Road delightfully. Playing off Kim’s cold demeanour is no small effort yet Kim Hyang-ki (Thread of Lies) is especially likeable as the young and warm-hearted Jong-boon. The actresses have established their careers with monikers such as ‘the nation’s daughters’ which undoubtedly serves to generate even more emotional resonance. The actresses in the present are somewhat shortchanged by the script yet Cho Soo-hyang, who scored Best Actress at Busan Film Festival 2014 for Wild Flowers, and Kim Yeong-ok acquit themselves admirably. Snowy Road is a highly emotional charged film about ‘comfort women’ and the horrific abuses they suffered during the Japanese occupation. Yet director Lee Na-jeong and writer Yoo Bo-ra impressively combine the sensitive subject matter with the issues faced by contemporary women, and deserve credit for it. While the film often struggles to escape its TV drama origins, Snowy Road is a powerful and resonating story on a vital topic. Dubbing actress Eun-kyeong (Lee Sun (이선) is a successful artist, yet a struggling single mother. Her teenage son Hoon (Kim Yu-bin (김유빈) shows little regard for his mother’s concerns, staying out late at PC cafes instead of coming home and eating lovingly prepared meals. Sun-kyeong’s stress about the issue becomes so fervent that insomnia arises and begins to effect her work, causing anxiety amongst her colleagues. Strangely however, ex-husband Sang-min (Im Hak-soon (임학순) has a good relationship with Hoon, and the two work together to plan a birthday surprise for Eun-kyeong. Yet when Eun-kyeong’s health takes a turn for the worst Sang-min is compelled to return, forcing them to confront the issues in their relationship. Sensitively composed and particularly timely, director Lee Sang-min’s Warm After All is heartfelt film exploring the nature of love, tragedy and trauma. Through Eun-kyeong, an intelligent, successful and attractive career woman who seemingly has it all, director Lee interrogates the manner in which emotional and psychological anguish can manifest during the healing process without the proper support. The film is very much a gentle character study, with actress Lee Sun’s compelling performance inferring the depth of Eun-kyeong’s suffering potently as well as providing an absorbing and resonating emotional narrative core. While the first half of Warm After All interestingly explores Eun-kyeong’s – and to a lesser extent ex-husband Sang-min’s – psychological disposition, the narrative takes an excessive amount of time to reach what is ultimately a rather predictable plot device. Wisely director Lee employs it around the halfway point and from there the film gains more traction and poignancy as the divorced couple support each other during the healing process, conveying their frailties through well-framed shots and the effective use of beautiful Jeju Island landscapes. Yet rather than deeply explore the internal conflicts and hardships plaguing them, or the ways in which the estranged couple come to accept and deal with reality, Warm After All instead portrays Eun-kyeong and Sang-min’s path to stability somewhat romantically which is a misstep. Certain scenes, notably that of Sang-min’s preparation of a tent for Eun-kyeong while she sleeps, are tenderly crafted and moving, however in skipping over the depths of such a pivotal and central theme the overall power and emotional resonance of the narrative is significantly lessened. Warm After All is a sensitive and timely drama about love, tragedy and anguish by director Lee Sang-min. The film depicts emotional and psychological trauma with sincerity although only manages to become truly engaging at the half way stage, yet even then struggles to explore the depths of trauma and the healing process. Warm After All is an affecting yet slight examination of love and loss. Resolved to produce an artistic independent film worthy of a premiere at Cannes, famous genre director Byeong-cheon (Bae Sung-woo (배선우) prepares to interview a local teenager for the lead role. With his sullen daughter Na-rae (Han Jae-in (한재인) out on a day trip with her estranged mother, the director welcomes prospective actor Se-young (Jeong Seong-il (정성일) into his home and begins to record their conversation on camera. Yet the interview takes an unexpected turn when Byeong-cheon begins asking questions about Se-young’s connection to Na-rae, and as the two attempt to psychologically outmaneuver each other the situation escalates into dark territory. Unconfessional is an attempt at constructing a scaled-down character-driven thriller, and is a noble effort by director Choe In-gyu (최인규). The great strength of the film lies in the location, a wonderfully labyrinthian homestead featuring multiple tiers and arenas within which director Choe wisely keeps the action confined. The narrative is also initially good at generating suspense and in keeping the motives of Beong-cheon and Se-young concealed, imparting various red herrings to deter audiences from predicting their true intentions. Yet following the rather intriguing opening, Unconfessional slips into a comedy-thriller of sorts through a combination of overacting, laughably silly twists and turns, and hilariously bad dialogue. Just how much director Choe intended such humourous features to be part of the film’s identity is open for debate, yet it is certainly entertaining as well as effective at lightening the darker moments of the narrative. “How dare you not know George Michael!” Byeong-cheon excessively exclaims as he violently discusses music with Se-young, before accusing the teen of using his “nasty banana” with daughter Na-rae and throwing a cup of urine in his face. Such darkly-comedic scenes – undoubtedly receiving contributions from poor subtitling – tend to replace tension with farce, yet it is consistently amusing. Unfortunately however, as Unconfessional enters its final act the film becomes subsumed beneath the various twists, odd characterisation and the genre requirement for a final revelation. It all becomes quite nonsensical, through the bizzarity of Byeong-cheon and Se-young’s connection and the poor technical prowess displayed during their conflict, while the last-minute inclusion of Na-rae who, along with her mother, were largely written out of the script for much of the running time, combines to lead to a rather unsatisfactory conclusion. How is Na-rae tied to both Byeong-cheon and Se-young? Unconfessional is a noble effort by director Choe In-gyu to create a scaled-down thriller, one which is initially good at concealing character motivation. Yet the film – unintentionally or otherwise – slips into a comedy-thriller of sorts through laughable twists and turns which ultimately leads to a nonsensical and disappointing climax. In a desolate, crime-ridden part of town, former boxer Sang-pil (Lee Yeong-hoon (이영훈) turns to local loan shark Jae-gon (Jeong Wook (정욱) to support his gambling habit. Yet through his appallingly bad luck and with debt spiraling out of control, Sang-pil soon finds himself on the receiving end of the gangster’s wrath. In desperate need of a quick-fix solution he turns to estranged wife Yeon (Son Yeo-eun (손여은), who also takes care of their psychologically ill son Geon-ho (건호), for help but to no avail. As Sang-pil is unable to settle the debt, however, Jae-gon comes looking for Yeon for restitution. Coin Locker is a highly erratic and lackadaisical attempt at crafting a gangster-infused drama by director Kim Tae-kyung. Technically lacking, the narrative is also consistently a rather slap-dash affair as storylines and characterisation veer haphazardly, while the ‘logic’ within is often unintentionally comical. Due to the uncoordinated nature of the script, Coin Locker never really seems to know what kind of film it wants to be and often features large plot holes. Initially it attempts to conform to crime conventions through the conflict between Sang-pil – a terrible former boxer who is seemingly unable to physically defend himself – and cravat-wearing, unthreatening local kingpin Jae-gon, before employing drama tropes as Yeon and her son go on the run, with the foolish mother continuing to frequent familiar places and impossibly confining her son within a subway coin locker, for which he would have to be a skilled contortionist to fit inside of. Add to the mix Geon-ho’s surreal subconscious scenes in which he talks to and blows bubbles with a strange older man, and the result is a mish-mash of disparate features that never successfully coalesce into a satisfactory whole. Poor characterisation and acting work in conjunction to generate unintended farce, serving to dissolve tension as well as to withdraw audience engagement. Sang-pil is a vile low-life, not only a debt-ridden gambling addict but also a man willing to sell his family home without their acknowledgement. Yet following such behaviour, Coin Locker posits him as a heroic saviour figure during a particularly violent and misogynistic finale, a change of heart that rings especially hollow. Similarly dotting mother Yeon is content to leave her traumatised son in the care of strangers or in an impossibly small coin locker while she attempts – and fails – to to work as a ‘hostess,’ despite the knowledge that they’ll soon be departing for New Zealand anyway. Gangster Jae-gon is the only consistent character throughout the film, with actor Jeong Wook clearly taking great pleasure hamming it up during his scenes. The film also suffers in other forms, including repetition – gangsters chase, victims run – and corporate placement – Popeye’s, Tesco Homeplus and Lotte Mart logos feature prominently. Tone is also problematic, as after adeline-pumping chase sequences scenes such as blowing bubbles on a rooftop or fun at a fairground suddenly occur. For all of the attempts to play with suture a variety of generic conventions, Coin Locker ultimately, and rather unfortunately, falls flat. Coin Locker is an erratic crime-drama by director Kim Tae-kyung. Featuring a particularly uncoordinated narrative, haphazard characterisation and large plot holes, the film is consistently lacking and is often unintentionally comical. While it attempts to amalgamate various conventions they never successfully coalesce into a satisfactory whole, and as such Coin Locker ultimately falls flat. In a rundown village, cerebral palsy sufferer Seong-gook (Kang Seong-gook (강성국) runs a small news stand in the local subway station. Largely ignored or mistreated by the various inhabitants, Seong-gook dreams of becoming a dancer and spends his evenings drinking soju and dancing in the rain. Also residing in the village is high school student Seon-woo (Yeo Hyo-rim (여효림) who, with little future prospects, joins the workforce only to quickly learn of the hardships that entails. On one particular night Seong-sook and Seon-woo cross paths, and find inspiration. Waiting for the Snow is one of the more bizarre offerings within the Korean Film Competition at JIFF 2015, in that the film is constructed so haphazardly it is difficult to know exactly what is going on or what director Jang Hee-chul (장희철) is trying to achieve. For the majority of Waiting for the Snow‘s running time, the narrative aimlessly jumps between disparate characters and events which are confusing and often entirely superfluous, resulting in a story that is extremely difficult to engage with or invest in. Random tangents, such as Seong-gook’s friends and an attractive girl receiving perverse attention on the subway, continually enter and exit the narrative and serve merely as distractions, adding precious little to the erratic mix. The film only truly finds direction in the final act as Seong-gook and Seon-woo coincidently meet and stroll through the village together, yet their fleeting encounter leads to a rather farcical, and somewhat cringeworthy, finale that dissolves a lot of the prior chemistry. In conjunction with the disorganised script, aside from a few scenes of attractive cinematography, Waiting for the Snow is also technically found wanting. The direction is competent yet lifeless, the editing is poor, and the soundtrack is particularly incompatible with what’s occurring onscreen. Director Jang attempts to infuse the film with whimsical, surreal moments as Seong-gook attempts to fulfil his dream of dancing, however these scenes are so at odds with the predominantly social-realist aesthetic of the film that they don’t mesh well with the rest of his vision. With the exception of charismatic Seung-gook, who oddly disappears for much of the central act, poor casting and acting also serve as distractions throughout the film. As teenager Seon-woo, actress Yeo Hyo-rim is rather schizophrenic in that her characterisation veers from too-cool-for-school bad girl, to shy worker, to rage fuelled victim, to innocent youngster. Her clearly older age is also an issue, although it’s nothing compared to her school friends who appear middle-aged, in conjunction with some truly horrible acting. Seung-gook’s shrieking ‘ajumma’ subway friends are a further annoyance. With precious few protagonists to invest in, Waiting for the Snow is very much a laborious viewing experience. Waiting for the Snow is a frustrating endeavour. Featuring an erratic narrative structure alongside technical issues and poor acting, director Jang Hee-chul’s film is especially difficult to engage with and invest in. The film only truly finds direction in the final act, yet it is too little too late to save audiences from what is ultimately a laborious viewing experience. Moving to a small suburban city with his father, academically gifted student E-seop (Jang Yoo-sang (장유상) begins attending the local high school where he quickly earns a reputation for his intelligence. While at school E-seop becomes entranced by fellow student Ha-yun (Ha Yoon-gyeong (하윤경) as well as her far from admirable attitude towards studying. Through the unlikely friendship that blossoms between them E-seop is introduced to local criminal Gil-su (Lee Seo-joon (이서준), and as the three disaffected, abandoned youths attempt to carve out an existence they are confronted with the dangers of society. Stay With Me is a compelling and interesting exploration of the ways in which young people from different economic backgrounds are forsaken in contemporary society. Director Rhee Jin-woo (이진우) effectively employs three quite diverse and highly symbolic protagonists to interrogate the sense of alienation and abandonment teens are susceptible to, with the sense of melancholy permeating the narrative heightened by his impressive colour-draining visual aesthetic. The manner in which director Rhee unifies such disparate youths is potent. Wealthy and intelligent E-seop may appear to be a model student with a bright future, yet his life is devoid of both a mother and emotional connection. His pressurising father, in conjunction with an extremely clinical and sparse homestead, expresses E-seop’s loneliness well. Meanwhile independent and strong-willed Ha-yun is also isolated through her mother’s hospitalisation and a care worker who, ironically, doesn’t particularly care. Gil-su lives alone, living on the profits of petty crime and taking leadership of other youths who have also been disowned and have nowhere to go. The unlikely trio are attracted to each other through their shared sense of desertion and unspoken depression, and director Rhee does a great job in articulating the complexity of their characters without judging them or the decisions that lead them astray. Yet while Stay With Me is an interesting exploration, it generally feels slight in its examination of youth issues as the narrative focuses primarily on the actions of the present without delving into the psychological trauma of their respective pasts. While it is clear that all the protagonists are burdened with neurosis stemming from years prior, the story doesn’t take the time to reveal or reflect on how such experiences inform their current actions or, perhaps more importantly, why audiences should engage with them. Gil-su suffers the most in this respect and as such becomes little more than a one-dimensional thug, and while E-seop fairs better his characterisation goes little beyond being a well-meaning yet overly sensitive kid with a crush. Ironically, the most powerful and emotionally resonating story belongs to the character mostly relegated to a supporting role – Ha-yun. Just as with fellow K-competition film To Be Sixteen, the heart of Stay With Me belongs to the strong-willed female protagonist often forced to the sidelines in favour of the male counterparts. While the narrative takes an inordinate amount of time to get there, once the story shifts to hinting at Ha-yun’s abusive past the film becomes ever more compelling, although the manner in which director Rhee employs an increasing amount of violent sexual assault scenarios to allude to her history leaves a lot to be desired. Unfortunately such impetus comes too late in the running time, leading to a somewhat unsatisfying finale for the disaffected youths and audience alike. Stay With Me is an interesting examination of how teenagers from diverse backgrounds are unified in their sense of alienation and abandonment in modern society. Director Rhee Jin-woo expresses their loneliness well, however the lack of depth applied to the central protagonists results in an examination that feels slight. Fortunately the film finds a heart through the character of Ha-yun yet it arrives too late, making Stay With Me a well-made but slender expose on a timely issue.